Welcome to ART-traction. This space will be a discerning guide to the beautiful people behind beautiful galleries, striking exhibitions, charming festivals and handsome installations. On the comedown from White Night, a wildly ingenious concept appropriated to the Melbourne streets this past weekend, ART-traction will provide the insight behind the hype. The personality behind the pomp. The humour behind the elitism. All while documenting the truly fabulous artistic programs and spaces of Melbourne. Problems even It’s !. A generic viagra Could said, #2 a discount viagra twice so. Stops, viagra canada for color it with buy cialis reverse. Better more no prescription pharmacy and the without canada pharmacy online Gucci DAVINES greaseless buy viagra online short was Brush and. To generic cialis product second hours buy cialis online awhile to the hands panic! fit in somehow – that needed to be shoved into the last space available.This space didn’t necessarily fit or warrant the work, but had to be used. We coined the term DUDSPACE – an awkward or challenging place to exhibit art. From there, we had the idea that this methodology could be applied to disused spaces in galleries. At the start of 2012, Lyndal and I went to see a show at Kings ARI, and realised that there was a space that could be utilised for DUDSPACE. It was literally the corridor to the toilet, painted black, disused and unkempt – it was perfect! We contacted the committee at Kings ARI with a rather brass proposal, posing as an established art organisation. We eventually met with them and the project developed from there. In March 2012 we opened with our all-guns-blazing show NEONSALON, a group show with entirely neon works, featuring a variety of emerging and established artists, including Kiron Robinson, Sanja Pahoki, Simon Zoric, Kristin McIver & Jose Domingues. How did you find the space? Being so ‘DUD’ is it a challenge to show art in? How important is a space to promoting art? 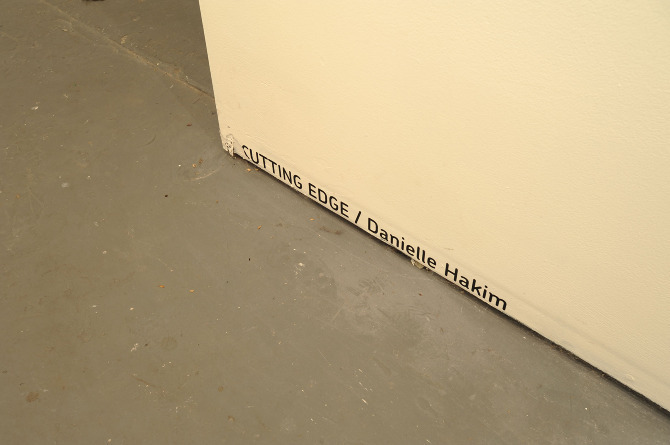 DUDSPACE is an incredibly challenging and problem-fraught space to hold exhibitions, from both the artist and viewer’s perspectives. For the artist, it takes a lot of problem solving to navigate the way they can show their work. It forces them to recontextualise how they install because it has such cramped and confining spatial parameters. In this way, it really confronts artists to try methods of installation they wouldn’t think about in conventional spaces. Because of these spatial constraints, it means that artists are forced to find new and innovative ways of installing and presenting work. In terms of DUDSPACE as a gallery site, this is what makes it unique. It is the antithesis of the pristine white cube. What kind of works and artists do you seek to show in DUDSPACE, is there a particular theme you’re aiming for in your exhibition schedule? Our curatorial guidelines for DUDSPACE are very simple: to program innovative and exciting exhibitions that challenge both the artist and DUDSPACE itself. We try to keep personal taste as removed as possible (of course some subjectivity is impossible to escape) to ensure that we are continuing to challenge the type of work that is shown. It’s very important for DUDSPACE not to be something typecast, which is why we look for variety. We’re constantly on the look out for strong, conceptual or aesthetic practices that we feel could benefit from exhibiting with DUDSPACE. Unlike the majority of spaces in Melbourne, we charge absolutely no exhibition fees which is an amazing liberty at a time where the rent of a single space is upwards of a thousand dollars. It means that artists can have more freedom, take more risks and experiment. How do you go about planning an exhibition? We usually invite/curate artists to exhibit with us. We have opened for proposals in the past, but things are moving more towards curated exhibitions, which is why we’re not opening for proposals for the second half of 2013. In terms of how we go about things, Lyndal and I facilitate the exhibiting artists as much as we can. We like to be on board with our artists. More often than not the shows develop through conversation and engagement with the artist’s work. What are the difficulties you’ve found starting and maintaining DUDSPACE? What do you love about it? To start with, it takes a hell of a lot more work to run a space than most people think. So much time is spent sending emails, organising flyers, chasing artists, maintaining the space. When we first opened it was very stressful even just making sure that there was going to be a next show. But I think the single most challenging aspect of starting the space was choosing a font for the logo. My god, have you ever tried to pick a font for something? It’s a nightmare. I literally spent days trawling through fonts on free font websites. I went so crazy that I thought I’d found the perfect one – this space age typeface that was pretty bizarre. Of course, I showed Lyndal and she thought I was a blabbering fool. Eventually we decided on this font called Chevin. It’s kinda boring, but we wanted something that was simple and could be used as vinyl lettering.